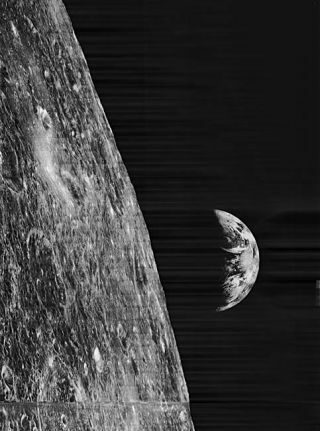 The first ever image of Earth above the lunar limb was captured by Lunar Orbiter 1 on 23 August 1966. This incredible image is a personal favorite of Mike Oâ€™Dell and David Kring. Note the parallel strips making up the image; arising from the way Lunar Orbiter photographs were scanned on board the spacecraft for transmission to Earth. Despitebeing more than 40 years old, images taken by five spacecraft that orbited the moonin the 1960?s are proving invaluable in planning for humankind?s return to the moon. BetweenAugust 1966 and August 1967, NASA?s five Lunar Orbiter spacecraftreturned more than 2,600 images of the moon and photographed 99 percent of thelunar surface. Thismultitude of images has now been digitized, processed and made available onlineby the Lunar and Planetary Institute (LPI). ?Wewanted to make these images available to as wide an audience as possible,? said Mike O?Dell, aprogrammer at the Lunar and Planetary Institute in Houston, Texas. ?Now, userscan find everything in one place, searchable, with documentation and of a highenough quality to use directly or to at least identify which frames would beuseful in higher detail.? Detailedstudy of Lunar Orbiter images is nothing new; the primary aim of the LunarOrbiter project was to image potential Apollo landing sites in highresolution. Infact the first three Lunar Orbiters proved so successful at this task that theremaining two missions were devoted to mapping the entire lunar surface. During the interveningfour decades, image-processing techniques have taken a giant leap and the LPItook a few small steps to ensure the Lunar Orbiter photos continue to looktheir best. ?Wedid a minimal contrast stretch and then we used software to de-stripe theimages, enhancing their clarity and beauty,? O?Dell said. Whilethese venerable images are both fascinating and beautiful, with Japan?s Kaguya and China?sChang?e 1 spacecraft currently in lunar orbit and NASA?s LunarReconnaissance Orbiter (LRO) set to lift off in late 2008, will these agingportraits remain relevant for long? ?TheLunar Orbiter missions were immensely successful,? said David Kring, a visitingscientist at the LPI. ?Those images are the baseline for existing geologic mapsof most areas of the moon, including the lunar south pole, which is being examinedas a lunar outpost site,? Kring told SPACE.com. Cratersat the south pole might harbor water ice, which could be used to drink and forfuel. And the polar location offers a spot with round-the-clock sunshine forgathering solar energy. TheLunar Orbiters commonly obtained image resolutions of 500 feet and even managedresolutions of 3 feet in selected places, more than enough to hold their ownagainst their high-tech camera-toting descendants. Thesehigh resolution images will play a major role in selecting landing sites for areturn to the moon under Project Constellation and also for more immediate roboticlandings. They might also be used to calculate how often the moon gets hit bymeteorites, something any astronaut stood out on the lunar surface willwant to know. ?Determiningthe size and frequency of impacting near-Earth debris is important because itwill enhance our assessment of impact hazards, both on Earth and the lunarsurface," Kring said. "Acomparison of the Lunar Orbiter data represented on our new Lunar Orbiter PhotoGallery and future LRO images is already part of the analytical plans for theLRO mission.? Thelunar Orbiter data might also dictate what future explorers will do when we reachthe moon. ?LunarOrbiter images are also being used to evaluate outpost architecture and todesign preliminary traverse routes across the lunar surface. The LRO data willaugment the Lunar Orbiter data and, in small localized areas, will provide evenhigher-resolution coverage,? Kring said.